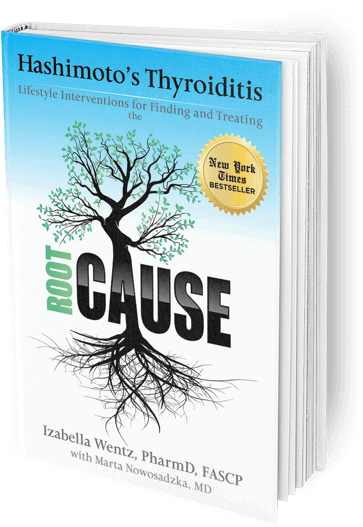 Hashimoto’s Thyroiditis: Lifestyle Interventions for Finding and Treating the Root Cause is a groundbreaking manual that will provide the reader with a roadmap to identify and remove the triggers associated with thyroid autoimmunity. This book is the result of three years of research and two years of testing by Dr. Izabella Wentz, a clinical pharmacist who was diagnosed with Hashimoto’s in 2009. Dr. Wentz combined emerging research with clinical expertise to identify and remove the triggers that caused her to develop a thyroid illness that was eventually diagnosed as Hashimoto’s Thyroiditis. You may have heard that thyroid medications are the only treatment option for people with Hashimoto’s and hypothyroidism, and that there is no way to halt or reverse the autoimmune process once it starts. If you have even suspected your thyroid might be behind symptoms like fatigue, weight struggles, trouble concentrating, etc., this is one of the most important things to have in your health library. This book has over 1500 positive reviews and has helped to create long lasting success stories! And now, you can get this eBook for $24.